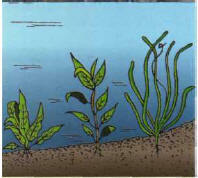 Plants can be obtained from aquarium stores and clubs, or they can be a present from a friend. Wherever they come from, do not forget that they are very fragile when handled outside water. The best way of transporting them without any deterioration is to put them into an airtight plastic bag, like those used for fish, that has been inflated and sealed. Yet again, it is a question of satisfying both aesthetic and technical criteria. A small ground plan of the aquarium can be useful in achieving a successful layout, taking into account the species available. Generally speaking, plants of the same type should be grouped together, setting off any isolated specimens. finally, you must allow the light to penetrate to the base of the plants. Do not cut the already existing roots, or bunch them together; on the contrary, spread them out as much as possible in the sediment. You should not bury clumps of plants very deep; only the roots and the lowest (often white) part of the stem should be covered by the sediment. When planting cuttings, remove any damaged leaves at the base of the stem then bury them to a depth of 4 or 5 cm. This is easier if you dig a small hole first with your hand or an appropriate tool, and pile soil around the base of the plant at the end of the operation. Plants like moss and ferns must be placed on the supports to which they are going to attach themselves. They will stay in place more easily if they are wedged or tied with a short length of nylon thread. Put floating plants on the surface of the water. Do not be surprised if the plants look limp. They will quickly take on a normal appearance when the lighting is switched on, as the attraction of the light will make them straighten up. From this point on, the aquarium must be lit in accordance with the recommendations that are given on previous pages. All that remains is to raise the water level to its final position and ... wait, before introducing the fish. When you plant your first aquarium, it is advisable to stick to a classical style and opt for an amphitheater layout. Distribute the plants that grow quickest along the sides and back of the tank; put those that grow at a moderate rate directly in front of them, with the smallest in the foreground. The arrangement of your plants must be visually pleasing, but also respect their ecology. This arrangement leaves space free in the center of the aquarium and gives a good impression of depth of field.